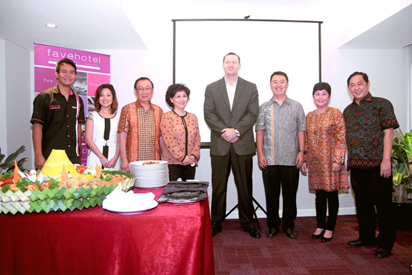 Jakarta, September 17th 2013 – After the recent opening of the favehotel Kelapa Gading , Archipelago International has now opened its 6th favehotel in Jakarta in Gatot Subroto near Mega Kuningan. 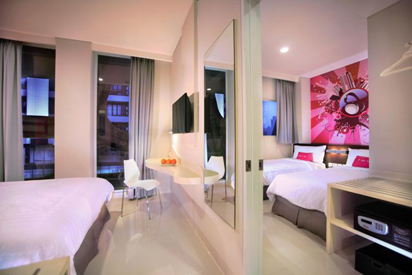 The favehotel Gatot Subroto brings highly anticipated budget accommodation to the otherwise expensive hotel scene around Mega Kuningan, offering 150 super-clean and stylish guest rooms equipped with LCD TV’s, high quality King Koil beds, individual air conditioners, en-suite bathrooms with standing showers and complimentary high-speed WiFi. Given its outstanding location in the heart of the capital, this latest favehotel allows for fast and easy access to Pacific Place, Planet Hollywood, Mega Kuningan's famous wining and dining hotspots, and the multiple corporate headquarters and embassies. favehotels also has plans for 10 more hotels in and around Jakarta with several openings scheduled for later this year in in LTC Glodok, Melawai and Zainul Arifin. Soft Opening favehotel Gatot Subroto - Jakarta, seen in the picture from left to right Mr. Nyoman Iswara – Hotel Manager, Mrs. Christilia J. Gunawan, Mr. Adi Nugroho, Mrs. Dian Anggraini, Mr. John Flood – President & CEO dari Archipelago International Indonesia, Mr. Yonathan Nugroho, Mrs. Acin and Mr. Handi Santoso during Rice Cone cutting. favehotels currently operates 6 hotels in Jakarta, 5 in Bali, 2 in Bandung and Solo and 1 each in Balikpapan, Langkawi, Surabaya and Yogyakarta and has a large development pipeline in Indonesia, Malaysia and the Philippines.